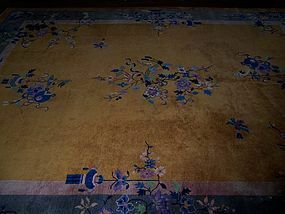 From our Chinese Polychrome Collection, a very fine Peking carpet, North China circa 1900-1920. This fine example features a mustard yellow main field decorated with floral sprays, flying birds, flower vases and Buddhist emblems, all well-executed in varying shades of blue, purple, light green, gray and beige. For a smaller but otherwise very comparable carpet in style and quality recently sold at Christies, see Christies Sale 3001, April 2012, Lot 351, sold for 2,478 US Dollars / 1,875 Euros. Size and Condition: A large carpet at approximately 11 feet by 9 feet. Overall condition is excellent with good pile and good retained color and vibrancy. There are random scattered areas of lower to low pile commensurate with age and use, as well as some random small areas of potential moth-eaten damage, but overall condition is still excellent with no truly notable damage or staining . Fringes trimmed where worn.